This ride is just under 7 miles out-and-back if you start from the San Francisco side of the Golden Gate Bridge. You will descend to Kirby Cove before the steepest parts of the Hawk Hill climb, but the ride still has plenty of steep stretches. The road down to Kirby Cove is dirt and gravel, and can be tricky to navigate. Road condition could be poor after significant rain. There is no toll for bikes on the bridge. On rare, fog-free summer days when sun-starved crowds pack San Francisco’s beaches, Kirby Cove remains delightfully quiet. 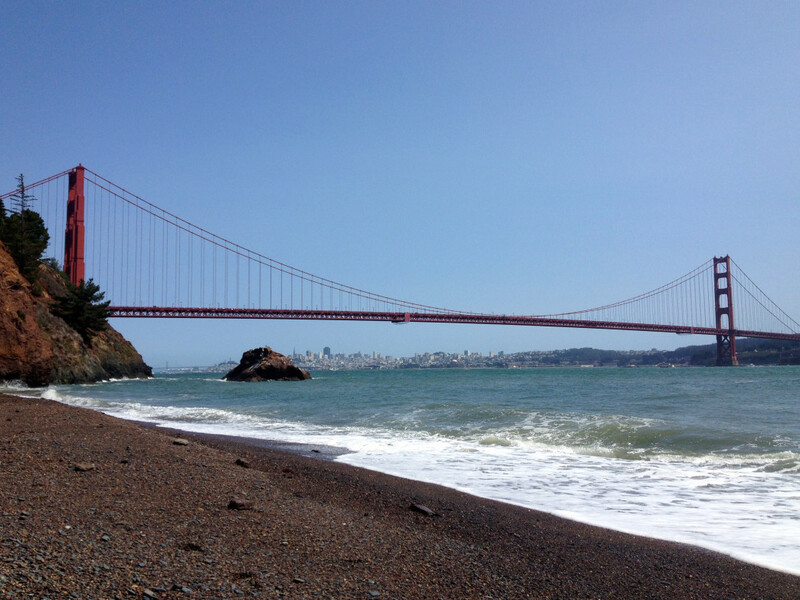 Tucked into the shoreline west of the Golden Gate Bridge, Kirby Cove’s dark sand beach offers a unique view of the San Francisco skyline beneath the bridge span. The ride to Kirby Cove will not challenge intermediate or advanced cyclists. The route does not lack adventure, featuring a bridge crossing, hill climbing, and a dirt road. 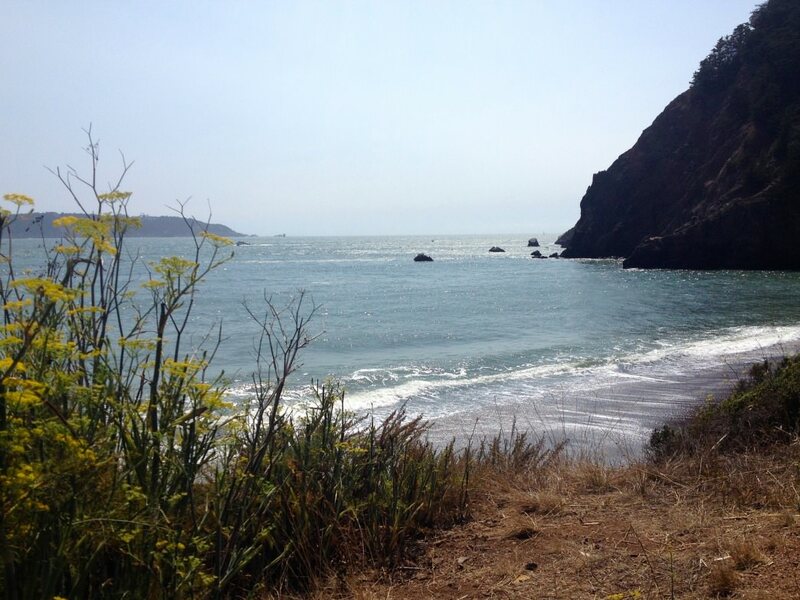 You will ascend just enough of Hawk Hill to work up a sweat and earn yourself a refreshing plunge into the ocean. From the San Francisco side of the bridge, the round trip ride will take the average cyclist under two hours, unless you linger on the beach—which is highly recommended. Riding across the Golden Gate Bridge, suspended 200 feet over the white-capped waters of the Bay below, is an exhilarating experience no matter if it is your first time or your hundredth. As you ride the two-mile stretch from San Francisco to Marin County, dodge selfie-taking tourists and catch a quick look at Kirby Cove, visible immediately west of the Bridge as you cross. Once you are safely across with solid land under your tires, follow Conzelman Road as it climbs towards Hawk Hill. Fortunately, the Kirby Cove Road cuts off after only about 200 feet of climbing, leaving the rest of the painful climb to the summit to your imagination. Take in sweeping views of San Francisco, the Bridge, and the Bay from the road as you ascend. Just past the parking lot that accesses Battery Spencer, pass through the entrance gate and begin descending the dirt road to Kirby Cove. The road descends about 400 feet over 0.8 miles on gravel and dirt to the beach below and has no guardrail, so be sure to check your brakes before you head down. When you reach the groves of eucalyptus, pine, and cypress that mark the campground, you have nearly reached your destination. Continue through the campground until you reach historic Battery Kirby, which marks the entrance to the beach. Carry your bike down the stairs, refresh yourself in the ocean, and enjoy the views of the Golden Gate Bridge from the reddish sand of the beach. Kirby Cove, somehow overlooked by most tourists and beach goers, is a beautiful reward at the end of an equally beautiful ride. Anyone with a decent bike will enjoy this ride. The scenery is stunning, and most of the riding is in a designated bike lane or off the main road. The route is not ideal for children unless they are strong, confident riders because the bike traffic on Golden Gate Bridge and the dirt road to Kirby Cove can be difficult to navigate. Make sure your tires can withstand the gravel, you do not want to end up with a flat at the beach. The beauty of biking—everything is free! No tolls, no parking fees.